Today, I’m sharing a deliciously moist and flavorful Pink Champagne Cake (doctored cake mix) Recipe. Nobody would ever guess how simple this dessert is to make, and the taste is out of this world! There’s something about Pink Champagne Cake that makes any occasion feel more special. It is perfect for all sorts of celebrations including bridal showers, weddings, anniversaries, Valentine’s Day, birthdays, and so on. The champagne flavor is subtle but unmistakable. We hope that you enjoy it! Preheat oven to 350 degrees. Grease and flour three 8 inch cake pans. In the bowl of your mixer add the sifted cake mix, flour, sugar, baking powder and salt. Whisk at least 30 seconds to combine ingredients. Add the melted butter, egg whites, vegetable oil, vanilla and champagne. With the mixer on low speed, increasing to medium speed, mix for 1 minute. Scrape the bottom and sides of the bowl. ADD THE COLORING GEL AT THIS TIME if you want a pink cake. We added the gel color with a toothpick to control the amount. Beat on medium speed for 1 more minute ( a bit longer if using a hand mixer). Scrape the bottom and sides of the bowl and put into prepared cake pans. Bake at 350 degrees for 30 - 35 minutes, check at 30 minutes. Recipe makes about 7 1/2 cups of batter. 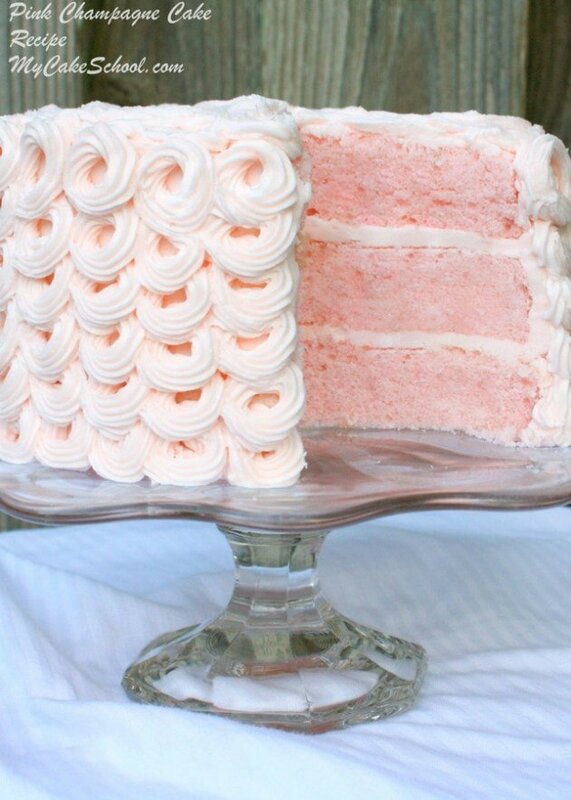 Nothing goes better with Pink Champagne Cake than Pink Champagne Buttercream! You can find our favorite recipe here: Pink Champagne Buttercream. If you prefer scratch recipes, we have a great one for Pink Champagne Cake! This has been one of our most popular recipes! Find it here: Pink Champagne Cake Recipe from Scratch! Hi Melissa. I made cupcakes using the doctored cake recipe. They came out flat and Shiney. What did I do wrong? Hi Melissa. I made cupcakes using the doctored cake recipe. I used Duncan Hines white cake mix. They came out flat and shiney. What did I do wrong? Hi Melissa just curious if I have a betty Crocker strawberry and cream box mix could I doctered this from other of your recipes e.g. white almond sour cream cake ?? Hi Genelle, We have not used the Strawberry an Cream box mix but it should work well for you, using the additions shown in the White Almond Sour Cream doctored recipe. I am assuming the cream (Strawberry and Cream) refers to the buttercream frosting in the mix.